Use the sound cups you made for the Mystery Sounds activity. If you have not done that activity, review those instructions, or make sound cups by placing objects in any small container with a lid (like film canisters). Rather than buy blindfolds, you can make them with scraps of fabric. Make sure you have enough for each pair of students. Ask your students if they have ever heard a loud noise outside of their room or house. Could they tell which direction the sound was coming from? How could they tell? Try to guess where the sound is coming from! Distribute one sound cup and one blindfold to each pair. 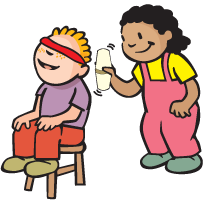 Have one student sit in a chair and put on a blindfold, or close their eyes tightly. Make sure that the second student can stand anywhere in front of, next to or behind their seated teammate, about a yard away (you may need to clear desks or tables away in order to make this possible). Teammate #1 (the “Shaker”) should shake the sound cup for a second or two and then teammate #2 (the “Guesser”) should point to where they think the sound is coming from. Make sure that the Shaker doesn’t make any other sounds (like asking “where do you think I am?”). The Shaker should try 10 different places, all about a yard away from their teammate, and record how many times out of ten the Guesser gets it right. Next, the blindfolded Guesser should put a finger in one of their ears, blocking the sound. The Shaker should try 10 more spots and keep track of how many out of 10 the Guesser gets right. After one of the teammates has tried guessing the sounds with both ears and then with only 1 ear, bring everyone together to talk about their experience. Was it easier, harder or the same when they guessed using both ears vs. using one ear? Were there some areas (on their left side, behind them, etc.) that were harder to guess than others? Have each pair repeat the process, this time switching roles. Did they get similar results to their teammate’s? Try using different kinds of sounds—are some harder to hear than others?